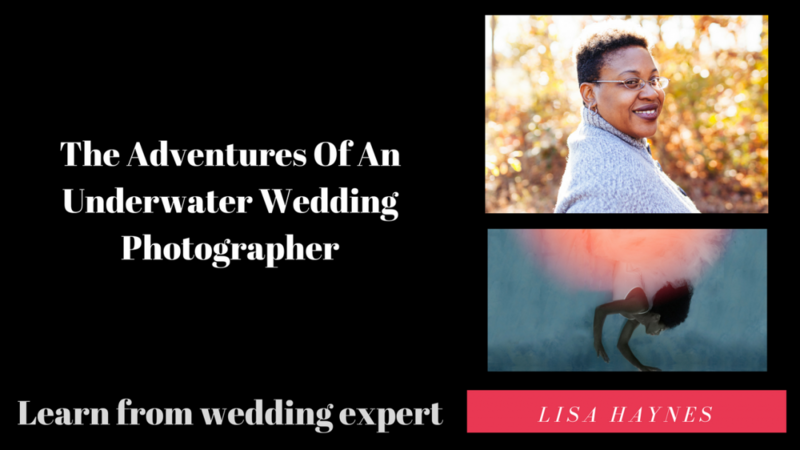 Lisa Haynes, the underwater photographer extraordinaire in question, would probably be quick to point out that she is neither just a wedding photographer (she does every sort of underwater shoot imaginable) nor just a underwater photographer (few are better on land than Haynes either). But we’re all about the wedding biz here, and underwater photography is what put Haynes on the map. How she got there is remarkable. I’m not sure that I’ve ever heard of a story of emphatically lemonade-out-of-lemons as Haynes’s. For much or most of her life, not only could she not even swim, but she as downright afraid of the water. I don’t mean a pesky fear, but a full-blown phobia. Determined to defeat her phobia, she signed up for swimming lessons. The first class started with an embarrassing display of public tears. The instructor, however, was divinely inspired to get Haynes over her phobia, so much so that she handed off her class to another instructor so she could work with Haynes individually, pro bono. Through that partnership, Haynes got over her fear of the water. But she wasn’t done. It was now time to actually learn how to swim – those first lessons focused on conquering the phobia. So she did indeed learn to swim, after a second run of swimming lessons. And she STILL wasn’t done! Having shown this phobia what’s what, she decided to kick more sand in its face and become a professional in the water – specifically, an underwater photographer. She saw a niche that needed filled, and she filled it. It’s all a part of what Haynes calls a purpose-driven life, and I’ve profiled few people who are so adept at going out and getting what they want. I’ve also profiled few people as interesting and as fun as Haynes. So what, exactly, goes into a underwater wedding shoot? Generally, her subjects do not wear scuba gear because that obscures their faces. Haynes has found that 4-7 feet of depth is the sweet spot for underwater photography. On the big day she has “water assistants” helping keep everything running aquatically smoothly, and she also does second shoots when called upon. At the end of the day though, this blog is about giving advice to folks planning their weddings, and Haynes has no shortage of sage pointers, starting with what couples should ask prospective vendors. It’s all a part of the crucial process of getting to know your vendors and making sure they are a perfect fit for you, according to Haynes. Fantastic interview! So funny and inspiring.